Along the roads of Rochester Drive, you'll spot Rochester Mall. There, on the second floor of the mall, you'll find a hidden gem tucked in the corner - 2fifteen Kitchen. I'll have to admit trying to locate the restaurant wasn't exactly the easiest thing but with proper signage all over the place to guide you (at the car park, the lift lobby, as well as the lift landing), you'll be able to find yourself in the restaurant in no time. This restaurant owned by Epicurean Concepts is headed by Chef Kenny Yeo. 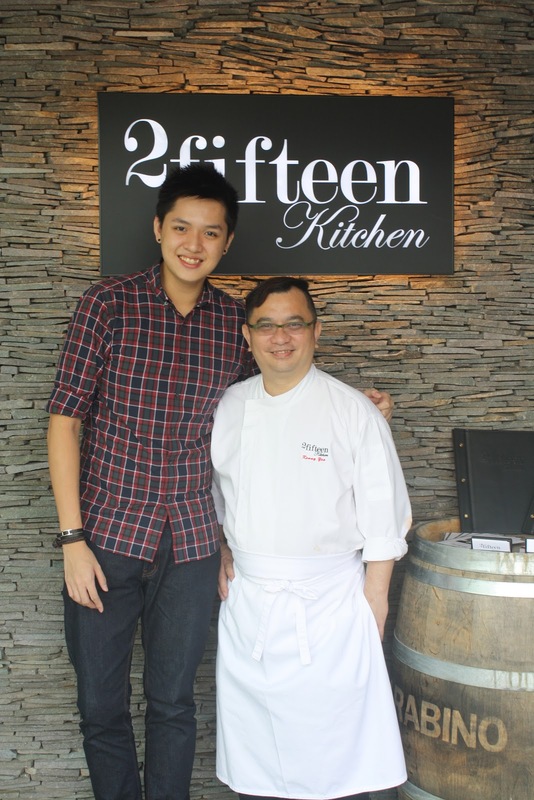 Why 2fifteen Kitchen? Their unit number is "#02-15". When i review a restaurant, i normally go straight to the point - the food. But this time i thought i'll do things a bit discordantly and acquaint the chef first. I had a quick chat with the very humble Executive Chef who frequently walked in and out of the kitchen and insisted on serving us each dish personally. Chef Kenny Yeo (or i would actually label him Masterchef Kenny Yeo after trying his food), shared with me his "story" about becoming a chef. He admitted to only having a PSLE qualification before starting on what he had passion for - cooking. Inspired by his dad, who was also a chef, Chef Kenny was quick and eager to learn the ropes at a young age, and eventually successfully made it as a chef. This is a very good example of determination, hard work and passion. He was also with several renowned hotels and restaurants before heading 2fifteen Kitchen. With almost 30 years of experience, he has cooked up almost all the types of cuisine you can name. And may i emphasize this one last time about how humble and unassuming he is towards praises about his food. No matter how un-photogenic the Frenmantle Octopus Leg with Citrus Oil, Ripen Tomato and Pearl Mango looks, it should not be judged that way. Apart from not looking especially appetizing, this starter was the right start to the meal. Juicy, soft, succulent octopus that has been braised in oil and slowly cooked (a bit like how they cook salmon confit) was served up with fresh greens, tomato and mango. I was already bought over by how the octopus was so tasty and aromatic but when paired with the mango, it tasted a bit like heaven on earth. Whoever thought foie gras and watermelon goes so well together? Served on a hot stone, the Quick Seared Foie Gras on Caramelized Watermelon and Green Apple Balsamic Syrup sealed the deal as well. The foie gras, which was the right texture and cooked perfectly - crispy on the outside and smooth on the inside. It also complimented what looked like charred watermelon. But then again, if i may remind you, how looks can sometimes be deceiving. The watermelon which was grilled was extremely sweet, it resembled biting into a chunk of sugar but in this case, natural sweetness from the watermelon which complimented the foie gras extremely well. This was my favorite dish of the whole lot - Pan-seared Hokkaido Sea Scallop, Braised Cannellini Bean with Lobster Bisque Foam. The scallops, which are gargantuan by the way, was cooked perfectly. I'm normally fussy with fresh scallops (just in case they are overcooked) but this one was a immediate winner within sinking my teeth into the thick, fleshy and nicely seared scallop. It went very well together when paired with the lobster foam and left a very distinct after taste. The Lobster Bisque with Crabmeat and Pistachio however was a bit too bitter for my liking. And before people start judging me for being a bad food critic, i must admit that yes, good lobster bisque is meant to be a bit bitter. Apparently Chef Kenny not only blends all the lobster shell to get such a strong thick bisque, he also crushes it (a lot of hard work and labour, mind you) to make sure the lobster flavor is immersed fully into the bisque. What i really fancied however, was the pistachios in the bisque as well as the chunks of crabmeat which i felt gave it a very good texture, instead of having to drink a whole bowl of soup in the same boring consistency. With a bit of an Asian twist, the Prawn Cappellini in Aromatic Oil was also good, if not excellent. I could smell the distinct balm of garlic as soon as the plate was served on the table. Can i also please add that at 2fifteen Kitchen, each plate i preheated and served HOT, just so the food remains at the right temperature. In this case, "aromatic oil" refers to lobster infused oil. Chef Kenny explained that he "makes" his own oil (he wouldn't share how he does it) from lobster and oil to use for cooking. I love how the garlic compliments the fresh prawns, which was also cooked perfectly, and that the whole dish was just bursting with aroma with each mouth full. We moved on to the mains after that and dived into this Slow Seared Pork Belly with Savoy Cabbage, Green Apples and Prosciutto in Poultry Sauce. I have to admit that i was a bit apprehensive about the pork belly while trying to cut into it. The skin was crispy, and it was difficult to cut into, hence i was expecting the meat to be a bit tough. But no, i was wrong (again). The meat was soft, tender and juicy. I would have liked it a bit more salty given that the cabbage was meant to be a bit more plain, but when eaten with the prosciutto, the whole dish ultimately still goes well together. I was surprised to see Grilled Angus Flank Steak, Garlic Potatoes, Shallot Confit in Red Wine Sauce on the menu. Firstly, flank isn't an expensive cut of steak. Secondly, flank is not easy to cook given it has quite a chewy texture. The steak was cooked medium and i really liked the shallots, which was bursting with flavors. The red wine sauce summed up the whole dish and complimented every aspect of it. Whoever said you need to have waygu beef to enjoy good steak? I always keep space for dessert so i was overjoyed when presented with a dessert platter. Consisting of Rock Melon Pudding with Passionfruit, Apple Tart with Almond (complimented with ice cream), Hazlenut Praline, as well as the Mango Mousse with Rice Crisp, the whole thing easily came together as one. I personally liked every single piece of dessert on the plate i wiped it out pretty quickly. The mousse has got to be the most commendable, followed by the apple tart. At the end of the meal, i wasn't bloated, but full. And i conclude good food does not make you full (or bloated), but rather they leave you satisfied. 2fifteen Kitchen also serves set lunch which are changed every week, as well as four to six course dinners. And yes in case you didn't get my point - i highly recommend this place, whether it is a friend or family gathering.